First on the PAC's agenda was a series of nationwide demonstrations against the hated “pass” laws instituted under The Reservation of Separate Amenities Act of 1953. Blacks were excluded, among other things, from living or working in White areas unless they had a pass – nicknamed 'dompas' ('dumb pass" in Afrikaans). Being present in urban areas without a valid pass, Blacks were subject to immediate arrest and summary trial, often followed by deportation to the person's 'homeland' and prosecution of the employer. Police vans patrolled White areas to round up 'illegal' Blacks found 'loitering' without passes. However, the blatantly callous massacres at Sharpeville near Johannesburg and Langa in the Cape on 21 March 1960 marked an important turning point in South African liberation history. The ANC launched its armed wing, Umkhonto we Sizwe (“Spear of the Nation,” or MK) in December 1961, with Nelson Mandela as its Commander in Chief. The PAC's military equivalent was Poqo (“Pure” or “Alone”), formed in February 1960 by Robert Sobukwe. The two organisations became closely identified with the sabotage campaigns they conducted. For example, in the first 18 months of their existence they orchestrated about 200 acts of sabotage sometimes with very fatal consequences. Their overriding aim was to overthrow the South African government in order to replace it with a democratic order which represented all the peoples of the land. In July 1963, the liberation struggle suffered a huge setback. Most of the prominent people in the ANC's underground movement, who were designing Operation Mayibuye (“Operation Come Back”), the plan to overthrow the South African government, were arrested at Lilliesleaf. Those arrested included Walter Sisulu, Govan Mbeki, Ahmed Kathrada and Dennis Goldberg. Nelson Mandela had been arrested earlier on other charges on 5 August in Howick, Natal. The leaders were subsequently tried for treason in the infamous Rivonia Trial (October 1963) after which Mandela and seven of his colleagues were sentenced to life imprisonment on Robben Island in June 1964. Oliver Tambo, a senior member of the ANC leadership, managed to escape South Africa and was to lead the ANC in exile for another thirty years. As apartheid legislation was increasingly enforced, separation between the different population groups increased culminating in the creation of ethnically defined 'Bantustans' (or 'Homelands'), which were designated lands for Black people where they could have a vote. These homelands were established out of the old 'Reserves" carved out by the 1913 Land Act. The Promotion of Black Self-Government Act of 1958 set up separate territorial governments in the homelands. The aim was that the homelands would eventually become independent of South Africa. In practice, the South African government exercised strong influence over these separate states and generally, government-approved 'tribal' leaders ruled over the Bantustans in a violent and corrupt manner with the full support of the South African government, which was responsible for their entire budgets and provided military assistance. Between 1960 and 1985, approximately 3.5 million Africans were forcibly removed to the 'homelands'. 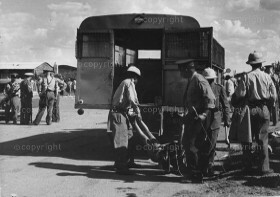 These rural dumping grounds functioned as reservoirs of cheap Black labour for White employers, but the apartheid regime also envisioned them as 'independent' territories that would ensure the denial of South African citizenship to millions of Africans. Some of these territories, such as Bophuthatswana, comprised dozens of isolated pieces of territory with no common frontier. Situated in the most unproductive regions of the country, Bantustans were inhabited largely by poverty-stricken women and children since men migrated annually to work in South African cities and towns, and farms as well.